Old friends, family gatherings, homeward-bound travel all go hand-in-hand with the holiday season-and, of course, so does taking photos of these special moments. I’d argue the iPhone is the best camera for the job for some of us, too. Sure, pricy digital cameras deliver much better pictures especially in the hands of a seasoned photographer. But for amateurs like me who don’t like to walk around with a bulky DLR hanging around their neck, the iPhone is the only camera that’s always within hands reach when that special moment arises. But can the iPhone camera really deliver the goods? Can you trust the iPhone to record special moments? After all, holiday photos will be treasured for years. First, let’s clear the biggest iPhone hurdle: please keep your iPhone charged. There’s nothing worse than wanting to take a photo only to see the battery icon in the red. There’s no getting around the much maligned iPhone battery, so be mindful about how you use your iPhone and take advantage of recharging opportunities. That said, the iPhone 3GS packs a pretty powerful camera (as opposed to the low-res cameras of the iPhone 2G and iPhone 3G, which are not good cameras to record holiday moments). The iPhone 3GS camera takes 3.2 MP pictures and has built-in zoom, which you access by tapping three fingers on the screen, as well as manual focus, which you access by tapping one finger on the area of focus. While the iPhone can’t compete with the pricy standalone digital cameras in terms of picture quality and features, I’m finding that it’s good enough for the holidays. Some phenomenal photos from the iPhone 3GS can also be found on the Internet. To be honest, I’ve never taken any pictures of that kind of quality. The iPhone camera is still just a camera, and the skills of the photographer make all the difference. Skills aside, I still like to take photos during the holidays. Thankfully, some cool iPhone apps help the amateur photographer produce some good pictures. I don’t take pictures through the iPhone’s camera app anymore — I take them with Snapture ($1.99). It’s basically the camera app with some very cool added features. For starters, you don’t have to hit the main button to take a picture, just tap anywhere on the screen (probably where you want the camera to focus). This forces you to hold the iPhone with one hand, while taking the picture with the other. The result is a steadier hand and a better image. The app shows thumbnails of the last few pictures you’ve taken, so you know right away if you screwed up and should take another picture. I particularly like the zoom and pan feature, whereby you simply reverse pinch the screen to zoom into the desired area. It’s much better than the iPhone’s camera app that gives you only one zoom option by tapping the screen with three fingers. 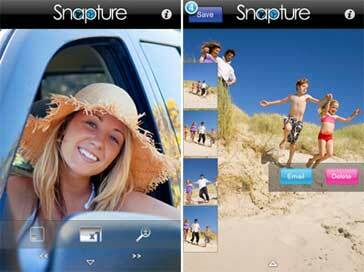 Also, Snapture’s zoom feature means you won’t need to buy a standalone zoom app such as Camera Zoom 2 ($.99). Snapture has a neat level aid feature that puts a leveler on the screen, so that you can align the picture properly. Rookie photographers need that sort of thing. For amateurs, the $2.99 Perfectly Clear app is a godsend. After I take a picture worth saving, I’ll open up the Perfectly Clear app and call up the picture from my camera roll. 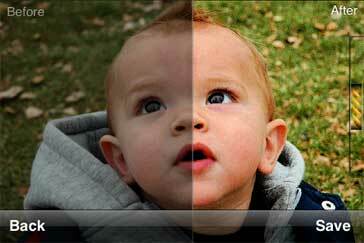 The app automatically improves the picture by adjusting the exposure, contrast, colour vibrancy, sharpness and tint. You can also adjust these manually, if you choose. More awesomeness about Perfectly Clear: the app divides your picture on the screen. Half of the screen shows the original image, the other half the improved image. More often than not, the improvement looks startlingly good. Simply tap the save button and save the improved picture to the camera roll, which will now have both the original and improved pictures. The whole process takes only a few seconds. Photogene ($2.99) is another masterful picture editing app, although aimed more for the experienced photographer. The app offers pretty much everything Perfectly Clear offers, plus a boatload of more features. A few cautionary words when buying iPhone photo apps: Many iPhone photography apps provide overlapping features, which makes shopping for them confusing. It can be frustrating knowing that you shouldn’t have spent a few bucks to buy one app when another app does the same thing and more. With Photogene, you can control the levels of colour, saturation, colour temperature, and even the amount of red, green and blue dots using sliding scales. You’ll find sharpness controls, pencil effect, picture tilt and more. One Photogene tool that really comes in handy is cropping. The top paid photography app in the App Store is colourSplash ($.99). This photo editing tool takes an existing picture from the camera roll, converts it to a black-and-white photo and lets you splash colour back into it. The app is made for amateurs-easy to use and brings an artistic quality to drab photos. It’s also pretty fun to splash colour. And, more often than not, you end up with a neat, professional-looking picture. Of course, not every photograph makes a good colourSplash candidate. In fact, the effect is only good for maybe one out of 50 pictures. So don’t quit your day job. Like colourSplash, these three apps-Camera Flash Deluxe ($.99), CameraBag ($1.99) and TiltShiftGen-provide ways to dress up flat pictures with special effects. Camera Flash Deluxe’s prized feature, of course, is flash. But be forewarned: It doesn’t really work like a regular camera flash. That is, it won’t help a photo that was taken, say, in the dark. Camera Flash Deluxe’s “flash” just lightens an existing picture. Dark pictures become grainier but not brighter. CameraBag offers a dozen completely different effects than Camera Flash Deluxe’s features. For instance, CameraBag can turn a photo into a magazine style, wide-screen cinema, instant camera or even old-style from 1962 and 1974. TiltShift Generator has a really neat effect: creation of retro miniature pictures. 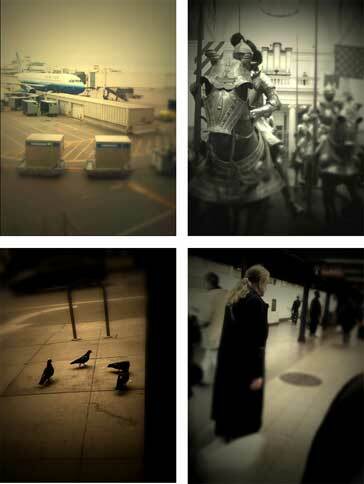 The app takes an existing picture and allows you to put part of it in focus and the rest out of focus. Using sliding scales, you can also increase or decrease the image’s saturation, brightness and contrast, as well as darken the four corners of a picture. Of all the “darkroom” iPhone app effects offered by colourSplash, Camera Flash Deluxe, CameraBag and TiltShiftGen, the latter is the one probably used most often. 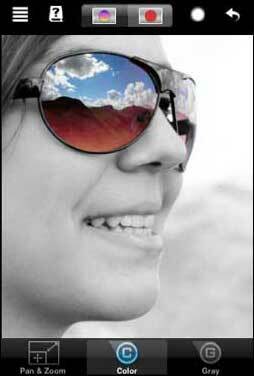 colourSplash, though, is the most popular. All in all, these effects bring some much-needed energy to an amateur’s drab holiday photos.